Here’s an overview showing where it is and how big it is. 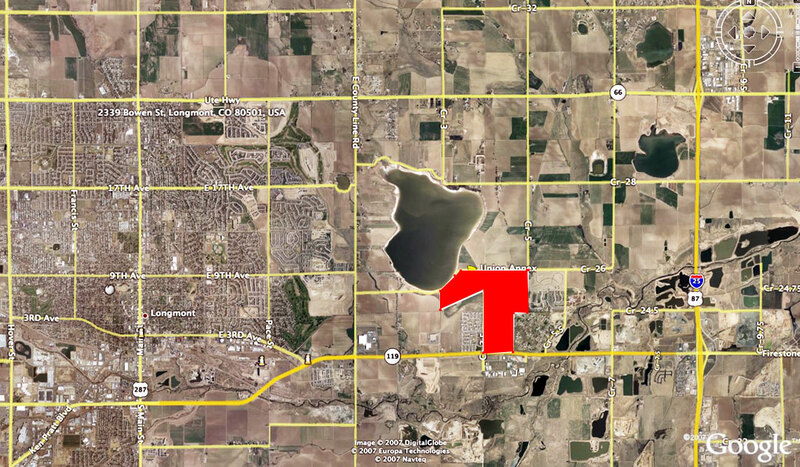 It’s easily as large as one of the old neighborhoods in Longmont – ie HUGE. Generally located north of State Highway 119, east of Weld County Road 3 Â½, south of Weld County Road 26 and west of Meadow Vale Farms and the Elms at Meadow Vale. 4. A preliminary PUD development plan for the ProAction Event Center on Block 5a and 6a totaling 150,950 square feet. Concurrently being reviewed is a preliminary plat and preliminary PUD development plan for the entire 313 acre Union development. The application proposes 175 single family dwelling units on 93.7 acres; 67 single family and attached residential dwelling units on 20 acres; 75 mixed use residential dwelling units (to include single family homes, attached homes, town homes and apartments) on 28.1 acres; 57.4 acres for future Civic and Religious Uses; 39.6 acres for future Mixed Use (to include commercial on the ground floor and commercial, residential and religious uses on second and third floors); 43 acres of open space; and 31.3 acres of right-of-way. Allow 13 lots without street frontage (3 commercial lots and 10 residential lots) in the Mixed Use area of the PUD. The final application being reviewed by the Planning and Zoning Commission is a preliminary PUD development plan for the ProAction Event Center. The proposed center is located on Blocks 5a and 6a of the preliminary plat and the structure would total 150,950 square feet. The center would allow for sporting events and other large gatherings to occur and the Life Bridge Christian Church plans to use a portion of the building for there temporary home after the sale of their property on State Highway 66 until a new church could be built on the Union parcel in the Civic/Religious area.